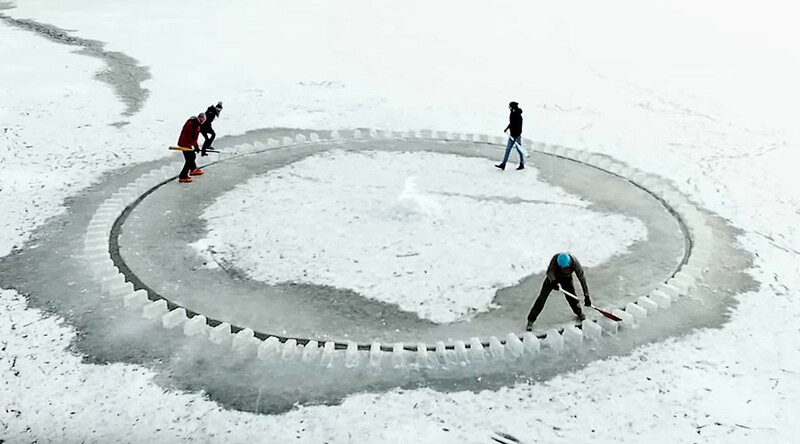 An icy amusement has been carved in Ukraine's Zaporozhye region, right in the middle of the famously wide and picturesque Dnieper River. A team of enthusiasts there have turned the ice covering the river into a functioning merry-go-round. Called the 'icy carousel' by the local media, the object appeared in Zaporozhye in southeastern Ukraine this week. Carved by a team of four people, it is located some 50 meters (164ft) into the Dnieper River, which is currently covered with ice 20cm (8in) thick. The merry-go-round is a round block of ice some 12 meters (40ft) in diameter, with its creators calling it an "art object." The attraction was inspired by similar winter amusements in Finland, one of the men behind the carousel told local media, as he took to the river, power-saw in hand. A man in Finland took the internet by storm in January, when he turned a circular block of ice into a carousel, operated by an outboard motor. The amusement ride carved on a lake near his country house became so popular that the inventor decided to make a larger copy of it near Helsinki, using solar power to move the ice. The daring team in Zaporozhye cut smaller blocks of ice around the main circle. They then put the ‘carousel’ into action with the help of those bricks, by pushing it with paddles. Saying that the icy block – estimated to weigh around 2 tons (4,000lbs) – simply cannot sink, they've invited everyone to take a ride. Five meters (16ft) of freezing water beneath the ‘carousel’ is nothing to be worried about either, they suggest. Meanwhile, local emergency services have said the ride is "dangerous" and asked people not to take risks by giving it a try, Zaporozhye's 061.ua news reported. According to emergency officials, the ice is not thick enough to hold many people. They've also warned that because the ice on the river had been carved, cracks might appear, making it "even more dangerous." Having reminded the locals that they don't live in Scandinavian countries with colder climates, officials said temperatures above zero degrees Celsius are expected in the region, and warned people to stay away from the shaky amusement.